Increased capacity to deliver Mental Health Care among Health care Workers in line with the National Mental Health Policy, the associated Strategic Plan for Sierra Leone, and international consensus. That is the WHO MHGap Intervention Guide. The health workers at Primary Health Care level have substantial general training, and are well placed to deliver basic and essential mental health care that is able to meet the needs of 50% of people with priority disorders in the policy. At present they do not perform this function, and the activities of UNIMAK in his 5 years project will fill in gaps in knowledge and competencies to allow them to do so. In as much as ongoing supervision will help them build skills, and be confident to use these skills. These will continue to contribute toward better quality of life for the people with Mental Health problems and their relatives. The quality of training that is integrated in general courses for nurses and Community Health Officers (CHO) will be increased, thus embedding essential mental health care skills in the development of community workers in preparation for community work. At this initially stage, local and international experts will be used, with knowledge transferred to the local trainers, who will be able to perform as independent trainers in their places of work in the future. The local partner leading this section – University of Makeni Mental Health Programme – has established expertise in delivering courses in mental health for health workers in Sierra Leone. With a support by CBM International, Global Initiative on Psychiatry-GIP, the WHO, who have already introduce the mhGAP programme in Sierra Leone and College of Medicine and Allied Health Sciences -COMAHS who have and will serves as a facilitator in the development of the National Mental Health curriculum which is to be used for the training of nurses of both certificate and diploma level. However, as Sierra Leone has be identified as a pilot country for mhGAP with the intention of replicating the work in other low income countries, the training being delivered is a long-term investment in people who will be engaged in offering health services in Sierra Leone for many years. These people therefore, and the trainers will be equipped to run courses, which will have an impact well beyond the scope of this project. • To increase the capacity of the mental health care sector in Sierra Leone to provide quality services. 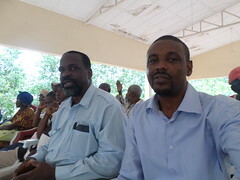 At the event of the start of the project at UNIMAK- Enabling Access to Mental Health and considering the time lapses on the project, the entire month of March 2011 was dedicated to prepare and setup the project office at UNIMAK and planning of meetings to meet with professional, stakeholders, service providers, Institutions and NGO`s in the field of mental health. As a result of these humble steps, several meetings were held in respect to achieve the specific objective one. The first point of call to earnest the implementation of the project objectives were that of the Faculty of Nursing College of Medicine and Allied Health Science-COHMAS. The essence and purpose of the meeting at this point was for the development of the National Curriculum on Mental Health, training of 22 health worker/service provider and Entry requirement. A one day consultative Meeting on proposed training programme to increase mental health care delivery capacity in Sierra Leone. The purpose of this meeting was to determine the level of mental health training already received by mental health and general health care professionals, and the degree to which the existing infrastructure enables them to provide care. Invitees were included the existing professionals at the Sierra Leone Psychiatric Hospital (Kissy), District Medical Officers (DMOs), Nursing and Midwifery Board, Medical and Dental Association, schools of nursing and CHO training, and coalition members. Relevant experts from the International and local NGO community will also take part in this meeting. The best relevant local expertise available from different organizations (Governmental, and Non-Governmental) will be identified in order to ensure that those with knowledge of mental health care in Sierra Leone will be used That the proposed curriculum for the training of health workers should be in line with the National Strategic Plan and the Mental Health Police. Support for the Development of the Psychiatric Nurse Diploma course at College of Medicine and Allied Health Sciences (COMAHS). It is but with modesty to inform you that UNIMAK has through COHMAS and stakeholders, Ministry of Health and Sanitation has developed a National Curriculum on Mental Health mid this year. 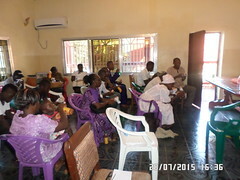 This course is already being planned for commencement in January 2012, has already been accepted by COMAHS Administration for its facilitation, to which it has been recognition by the Sierra Leone Midwifery Board, the Directorate training and Non Communicable Disease and Research, Ministry of Health and Sanitation. This, for the being will be the only course producing Mental Health professionals in Sierra Leone. This Document is in line with international standards. (eg. mhGAP). Several meetings are to be held on this. Identification of Health Workers already working for Mental Health Service Providers (Mental Health Community Workers, Psychiatric Hospital, mental health service clinics etc.) for relevant training in mental health according to their positions. This has already achieved through consultation with the relevant service providers, and be guided by strong, pre-determined, criteria for choosing people likely to be committed to long-term service. In the case of the general nurses for specialist psychiatric training in COMAHS, DMOs have been visited and asked to provide trainees from the pool of general nurses in their districts. This makes it more likely that they will return to work in the Districts. To reinforce this however, they will sign bonds of service post-training, and have much of their practical training in their own District. They will also be used for local training of Traditional Healers, Pastors, and Imams, as well as providing supervision of PHC staff. The nurses from district level services will be trained at the 18-month diploma course at COMAHS in Freetown following a recommendation by the District Medical Officers. A total of 22 nurses from the 13 Districts (inc. Freetown), plus Sierra Leone Psychiatric Hospital, City of Rest, Prisons and NGOs will be trained. Discussion with the Ministry Of Health and Sanitation from the beginning of the project is already in progress to ensure that they are posted appropriately. The terms of service of the Sierra Leone civil service already ensures that they will be promoted (achieve greater remuneration or risk allowances) graduation to ensure motivation to engage in this further study. After completion of the training program, the psychiatric Nurses provide the most comprehensive service at District level, taking referrals from PHC staff (general nurses and CHOs) and providing ongoing supervision of their work (eg following up clients with chronic conditions like schizophrenia, epilepsy or severe depression). Support for development of Basic Course for in practice General Nurses/CHOs (UoM). This course will be coordinated by the University of Makeni. The curriculum for the course will be based on their existing course for nurses, but updated to reflect the role of general PHC staff (nurses and CHOs) in delivery of the national mental health programme. 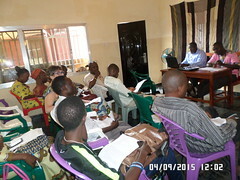 Curriculum updates workshops for nursing schools and CHO Training College in Sierra Leone. The aim of this one-week workshop is to review the current psychiatry teaching in the core curriculum for general nurses and CHOs. The content of the curriculum, as well as the capacity of the staff to deliver the content will be reviewed, and plans made for improving the quality of the course delivery. Concrete steps will include; updating the curriculum content to meet the needs of the Sierra Leone mental health policy, reviewing teaching methods, practical experience modules, and course materials. Annual review of training courses. The aim of this review will be to assess and evaluate the effectiveness of the structure and content of the health workers’ and mental health service providers’ training courses, and suggest and make improvements where necessary. Also to review effectiveness of graduates in practice once in post, and look at how training and supervision structures can improve effectiveness. Training for Mental Health staff working in Mental Health service providers. Foundation training will be provided for psychiatric nurses and PHC staff in order to be able to provide basic mental health services at PHC and District levels. This will be in line with the National policy and the strategic plan, and be supported by continuous in-service training and supervision provided by seniors. General PHC staffs (nurses and CHOs) are the first point of contact in the formal health system in Sierra Leone. Districts have between 8-12 PHC units each, staffed by this cadre (about one per Chiefdom). A total of 150 staff (10 from each of 12 Districts, plus 20 from Freetown and 10 from NGOs) from this level will be given grounding in identification, first-line treatment, referral, and follow-up of major classes of mental illness. It will be delivered in three sites round the country (Freetown (W), Bo (S), and Makeni (N)) in order to allow easy access to the training sites for participants. DMOs (and NGO Directors) will be asked to nominate the participants, who will be expected to attend 2 training courses, each lasting 2 weeks. Supervision of Staff, and ensuring support of community work. Following the completion of foundation training; continuous in-service training and supervision will be provided for staff in the national mental health service at all levels. This is essential as there is considerable evidence to show that training has little impact on service delivery unless there are structures for continued supervision in place. Public health/systems training for mental health leaders in the country. The National Mental Health Strategy identifies the need for 4 Psychiatrists (one for each Region) to oversee the national MH programme. This group will provide essential expertise at the tertiary level, and supervision of Psychiatric Nurses at District level. Lack of knowledge about public health issues has been identified as a weakness among MH leaders. There now exists a West Africa Regional course based in Nigeria (University of Ibadan) and supported by CBM, which provides MH professionals with this knowledge as well as continuing to support them by developing a network of such leaders in the Region. The 4 senior mental health staff in the country as well as the National MH Programme Co-ordinator (MOHS) will attend this course. Ideally, the Regional Psychiatrist will supervise the work of the Psychiatric Nurse in the Districts in their Region. As it is unlikely that every Region will have an assigned Psychiatrist by the end of the project, regular (quarterly) supervision and in-service training sessions will be provided by the Clinical Coordinator until these are in post. Once they are in post, this responsibility can be handed to them. The quarterly meetings will last 2 days and take place in Freetown. They will involve supervision of clinical work of the nurses by review of their cases as a basis for learning, review of the project activities in the Districts, training and skills development. Best practices in management of chronic conditions suggest that there is regular follow-up of clients on the community who have had treatment initiated. The Psychiatric Nurses should therefore visit the PHC on a regular basis to oversee the ongoing care of clients, and identify and respond to problems. The Psychiatrist Nurses will therefore visit each PHC once in every 3 months (average one per week) in order to do this, and to collect project data to use during their quarterly supervision. In this way, PHU staff will be motivated to continue identification of clients, and follow-up existing cases. Complex cases unable to visit the District Hospital can also be seen on this visit. Psychiatric nurses working on the district level, will be actively involved in the networking and educational activities in their district. Beside their treatment practice and routine work with the clients, the nurses will be engage with traditional healers, religious leaders and local organisations involved in mental health-related activities (eg, working in the fields of HIV/Aids, child welfare, human rights, care of victims of torture etc). Establishment of such a network is an essential part of the work of the newly placed District Psychiatric Nurse, as it helps will help to set-up reciprocal referral mechanisms and will get more people and organizations engage in mental health care provision. To support nurses in their network role and more specifically in providing trainings, a workshop for nurses will be organized as an extra-curriculum activity. Workshop for psychiatric nurses from 13 districts to deliver of one day workshop for traditional healers, religious leaders and MH-minded organizations to be held in each district. The content of the training will emphasize the importance of engaging traditional healers, religious leaders and MH-minded organizations acknowledging their role, and helping them to understand that it is possible to combine traditional and spiritual support with western psychiatry. Specifically, nurses will be able to identify which problems they can best deal with, and which (severe) mental disorders they should refer to the PHC system for medical treatment. Senior traditional healers and religious leaders will be invited on this training. This training will be co-ordinated by University of Makeni and will for 5 days. This workshop will be held in collaboration with CAPS, who are co-ordinating the sensitisation programme in communities, for ongoing collaboration in their own area. This training will be supported by the international experts in this field.